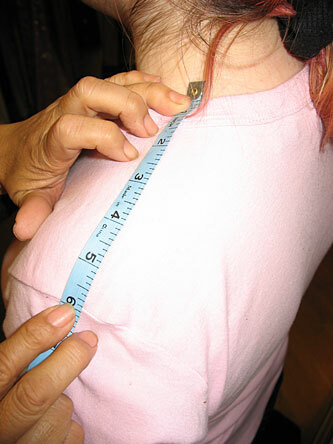 This section explains what measurements we may need and how and where to measure yourself. We'll refer you here after you've decided to have a costume commissioned. 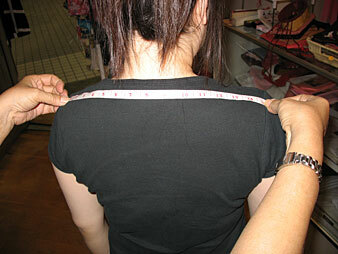 We will always let you know which measurements we'll be needing from you. 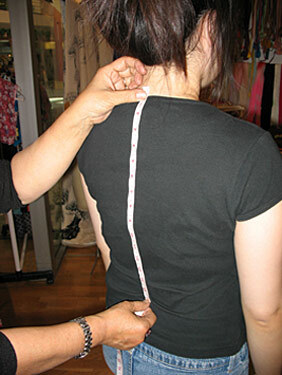 You'll need to use a tape measure, should wear comfortable fitting clothing that isn't too tight, and have someone help you do the actual measuring. 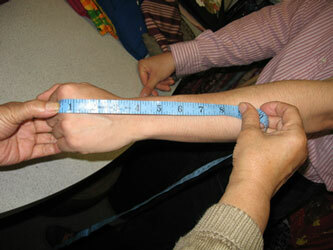 Though we prefer measurements to in be inches, we can accept centimeters (cm) if need be. 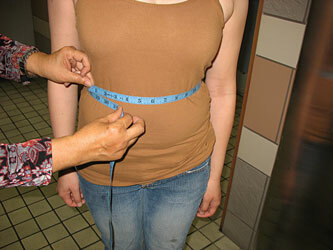 Please be as accurate as you can when having yourself measured. Inaccurate measurements means an inaccurate fit and we are not liable if you submit inaccurate measurements! To make sure, you may want to take measurements several times. For hats, hoods, headbands, etc. 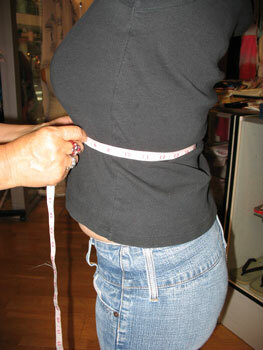 Measure around the widest part of your chest/breast. 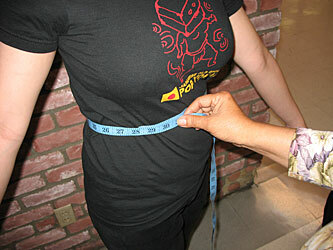 Keep the tape measure as horizontal (straight) as possible. 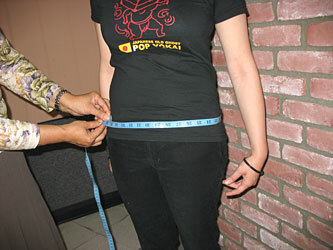 Measure the part of the abdomen between the ribcage and the hips. This is also the narrowest part of the body for some people. Keep the tape measure as horizontal (straight) as possible. 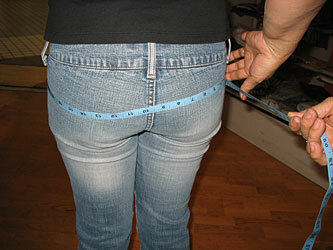 Measure the widest area of your hips, which is also the widest part of the body on some people. 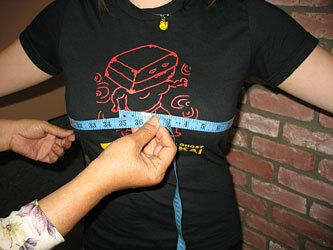 Keep the tape measure as horizontal (straight) as possible. 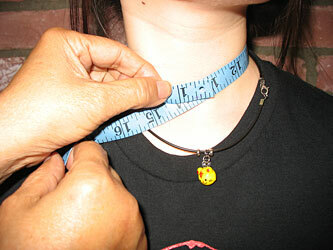 Measure around the base of your neck. For males, be sure to go over your Adam's Apple. Tape measure should start at the left shoulder. 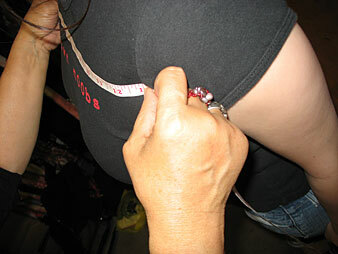 Notice the measurement begins where the stitching is at the intersection of the shoulder to body. And end at the right shoulder. 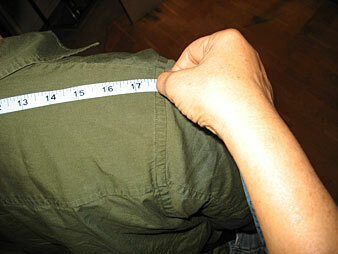 Again, please notice the measurement ends at where the stitching is at the intersection of the shoulder to body. 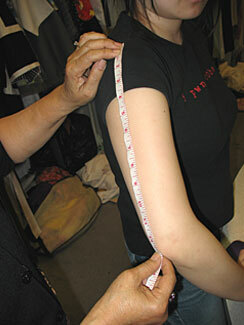 Measure the rear shoulder, from left to right. 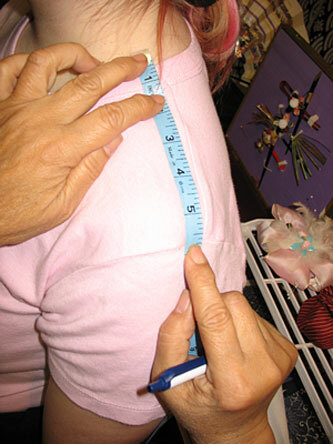 This is the measurement between where the stitching connects the body with the shoulders. Keep the tape measure as horizontal (straight) as possible. Alternatively, if you feel your shoulders, you can feel the hard, bony points at the edges. Measure from the leftmost bony point to the rightmost bony point. 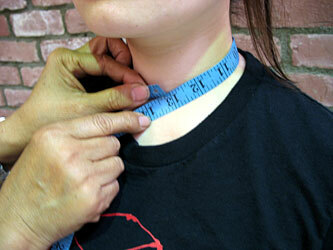 Measure from the base of your neck to your shoulder joint. Notice it starts around the neckline of your shirt and ends at where the stitching is at the intersection of the shoulder to body. 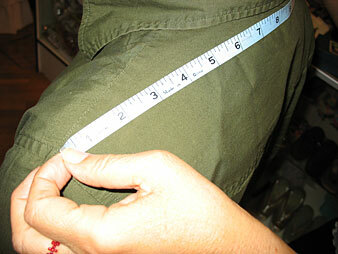 This measurement is usually for jackets and coats only, but it can still be a useful measurement for us. 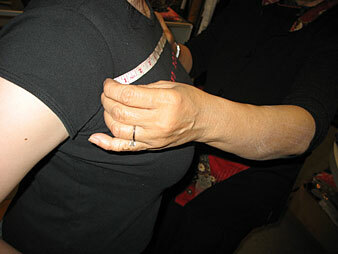 While standing as straight, measure from the center of your neckline, in between the collar bone, down to your waist (slightly below your navel). 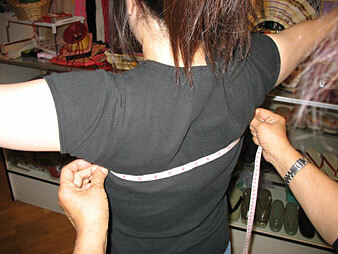 While standing straight, measure from the rear of your neckline down to your waist. 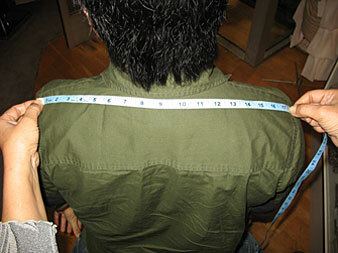 This is the same measurement from the Front Length, except it's from your back. 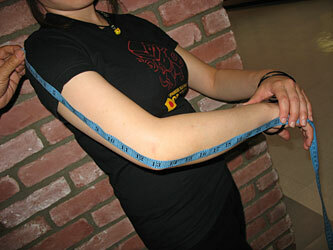 While holding your arm at a slight angle, from the shoulder joint, measure down to your wrist. While holding your arm at a slight angle (same as previous measurement), from the shoulder joint, measure down to your elbow. 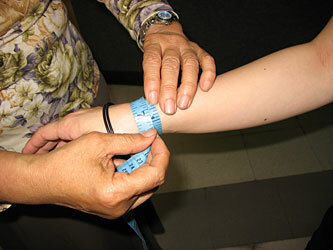 Measure around the circumference of your wrist bone. 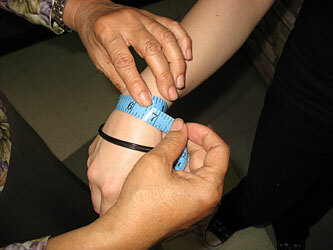 Measure around the circumference of your upper arm, above the elbow. 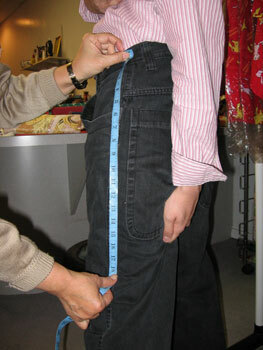 Measure around the thickest part of your thigh, which is usually right under the crotch in most people. 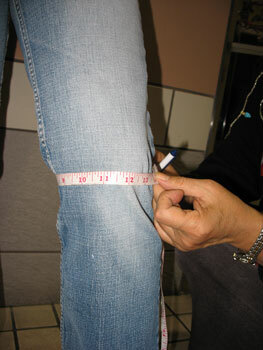 While standing straight, measure around the circumference of the knee joint. While standing straight, measure around the circumference of the ankle joint. While standing straight, measure from your crotch to your ankle. 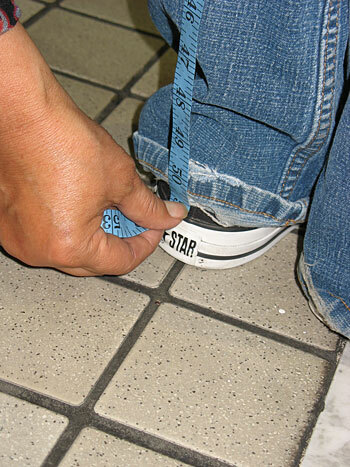 While standing straight, measure from your waistline to your ankle. 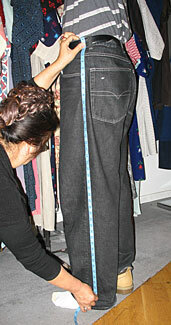 A good way to find your waistline is to wear a comfortable fitting pair of jeans or pants (not low-rise) and measure starting from there (see picture). 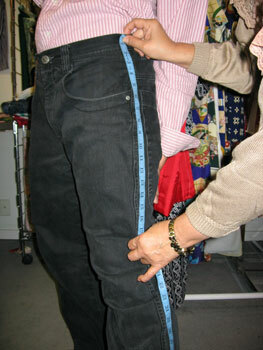 While standing straight, measure from your waistline to your knee. 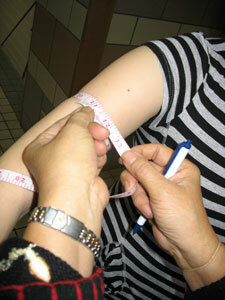 Refer to the above measurement for information regarding your waistline. 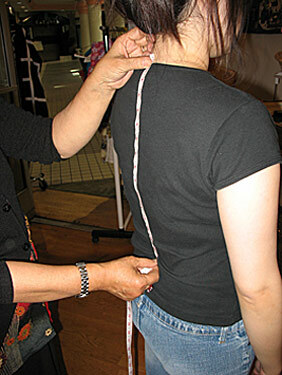 From the back and standing straight up, measure from the base of the neck down to the heel of your foot. Don't measure all the way to the floor, the back of your heel (or about 1" off the floor) should be good enough. 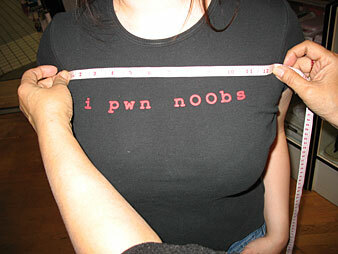 This is the measurement directly under the breasts. Keep the tape measure as horizontal (straight) as possible. 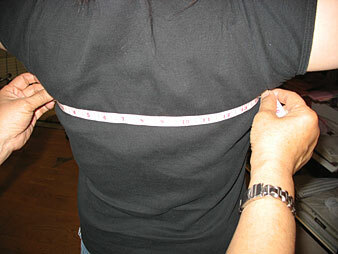 This is the measurement just above the breasts, from the left to right shoulder. 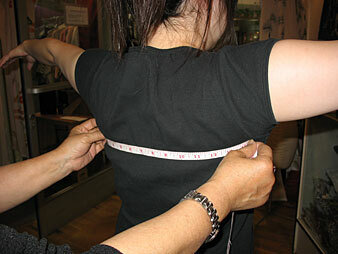 Like the shoulder measurement, measure between where the stitching connects the body with the shoulders. Keep the tape measure as horizontal (straight) as possible. This is similar to the above measurement except it's from the rear. 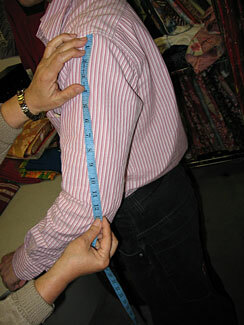 Also similar to the shoulder measurement, measure between where the stitching connects the body with the shoulders. Keep the tape measure as horizontal (straight) as possible. 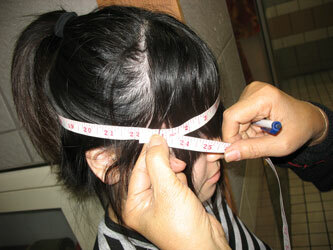 Measure the circumference of your head, with the tape measure going around your forehead, above the eyes. Keep the tape measure as horizontal as possible. Lay your hand on a flat surface while holding the fingers together (no need to be super tight). 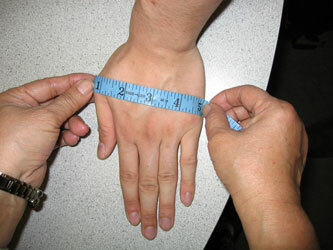 While keeping the tape measure as horizontal as possible, measure across from the width of your hand starting from your thumb joint as shown. 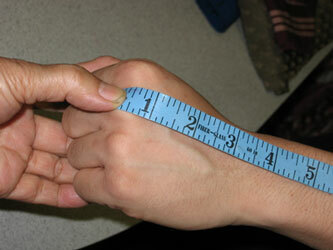 While making a fist, measure from your second knuckle (the one that sticks out the most) up to your arm. 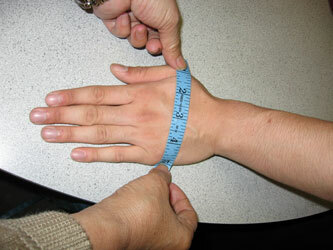 The length you measure up to your arm would depend on how long you want the gloves to be. 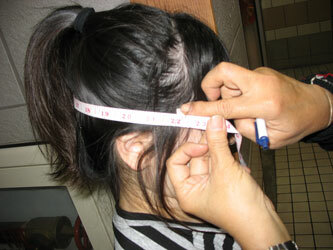 Before you do this particular measurement, we will always talk to you about it beforehand.